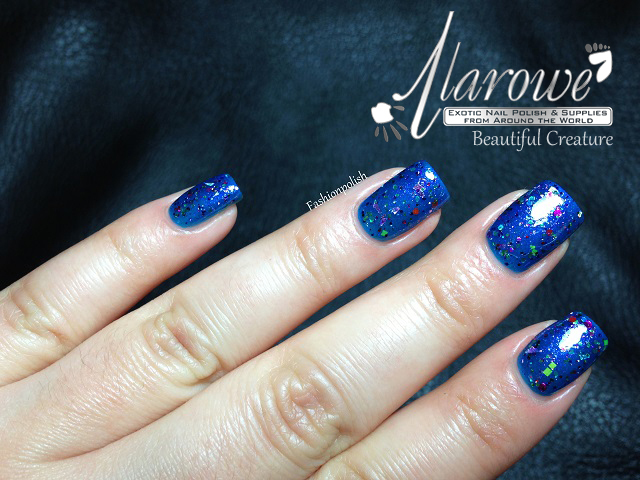 Fashion Polish: Two weeks of Colors by llarowe : Beautiful Creature! Two weeks of Colors by llarowe : Beautiful Creature! Hi girls, I hope you've all had a great weekend! Mine was kind of busy, real life busy. I spent time with my friends and family and it really felt nice for once. Not that it doesn't usually LOL, just that we rarely have the time to actually be together. Well, anyway, today I have another Colors by llarowe shade to share with you : Beautiful Creature! Beautiful Creature is a multicolored mix of glitters, including a few holo pieces, in different shapes in a sheer purple base. I doubt it would ever reach full opacity on its own so I decided to layer it over Colors by llarowe Montana Sky (review coming soon). Application was easy and glitter payoff quite nice, this is one good coat plus topcoat. This polish is lovely! Fantastic swatches!